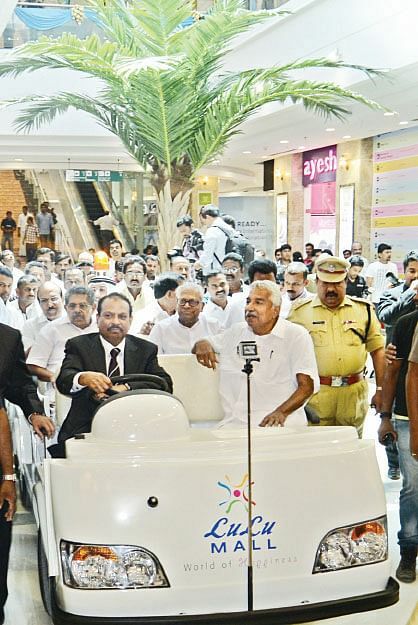 \'When I stepped into Lulu Mall in Kochi, my feeling was that I had reached Dubai or London,\' said Chief Minister Oommen Chandy while inaugurating the Lulu Mall at Edappally bypass on Sunday. “When I stepped into Lulu Mall in Kochi, my feeling was that I had reached Dubai or London,” said Chief Minister Oommen Chandy while inaugurating the Lulu Mall at Edappally bypass on Sunday. Thousands thronged from 4 pm in the evening to have a glimpse of the highly-spacious mall spread across 17 acres. With a space of 25 lakh sqft is indeed a world class one in its look and feel. As many as 320 international and national brands have a presence in the mall out of which 46 are coming to the state for the first time. According to the officials, about 30 new brands, including Walt Disney and Barbie will come to the mall soon. Out of the total 200 shops, a majority of them have become operational on Sunday. “The remaining shops will be operational soon. Our aim is to convert the mall into a tourist destination,” said M A Yusufali, managing director, Lulu Group. Almost all the jewellery brands have their outlets on the first floor. The second floor is exclusively dedicated to apparels and there is a Lulu hyper market too. Arranged in a stylish manner, the mall has something which urges one to buy everything that are on display. The mall also boast of cleanliness. As many as nine movie screens, with a total capacity of 2,250 seats, will open in the mall by early April. Marriot Hotel, which is under construction near Lulu Mall, will be completed before end of this year. The food court with a capacity of 3,000 is at the top floor of the mall with 27 cuisines. The exclusive entertainment zone is also in the same floor. ‘Lulu connect’- the electrionics outlet - with all major brands with a flexible price range is another attraction. Men’s ethnic wear brand ‘Manyavar’ opened its second store in Kerala at Lulu Mall. The brand has an outlet at M G Road. Manyavar has expanded its presence to more than 95 cities by opening up 236 stores all over the country recently. The Manyavar store at Lulu Mall has ethnic wear varieties consist of Sherwanis,Indo-westerns,kurtas,suits and accessories like Juti, Safa, Kilangi, Mala, Scarf and broach for men and children. The new store is dedicated to the Indian audience. The Sherwani and Indo-western range is very new, the officials said.